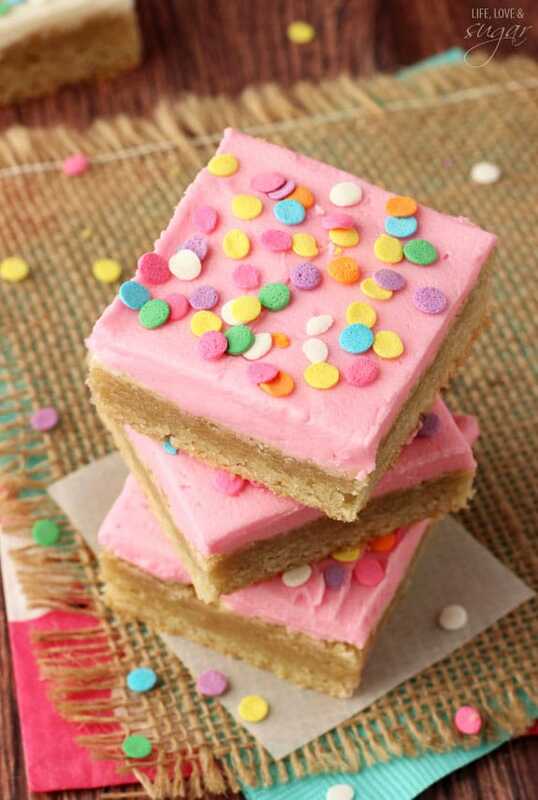 These easy Frosted Sugar Cookie Bars are a classic! 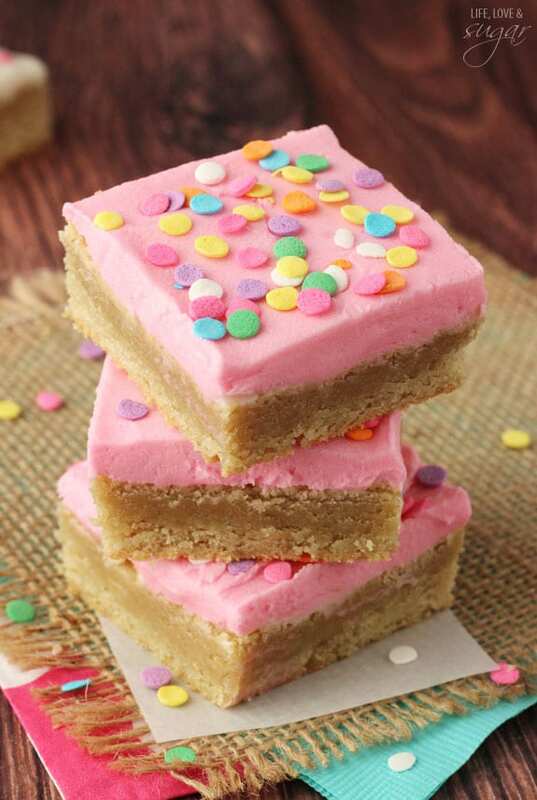 Everyone should have a go-to soft, chewy and delicious sugar cookie bar recipe. 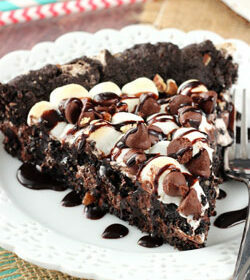 This is definitely that recipe! With the holiday season officially upon us, cookie plates are going to be going around like crazy. All the baked goods are definitely one of the best parts of the holidays – in my opinion anyways. I remember making cookies every year at Christmas with my mom and younger brother. We would actually do a few varieties of cookies. Some went to feed Santa on Christmas Eve and the rest were used for the Christmas party my parents hosted on Christmas Day. I always loved seeing which cookies got eaten first. One cookie that was always included was sugar cookies. 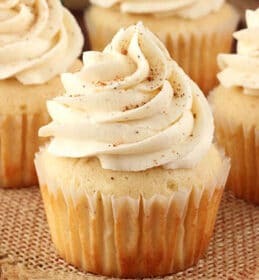 We’d decorate them with Christmas colored icing. Sometimes we’d even use cookie cutters to make little Santas and snowmen. One of the most important things to have when making a good sugar cookie is a good quality vanilla extract. If you’ve read much on my blog about my mom, you know she doesn’t really bake. Cook? Yes. Bake? Not so much. But at Christmas we’d always make all the cookies from scratch. It was tradition. And McCormick was always the brand of vanilla extract we’d use. In fact, McCormick was the brand of choice for most extracts and spices in our house growing up and now as an adult they are the ones I always reach for. They are great quality ingredients and they are always easy to find at the grocery store. 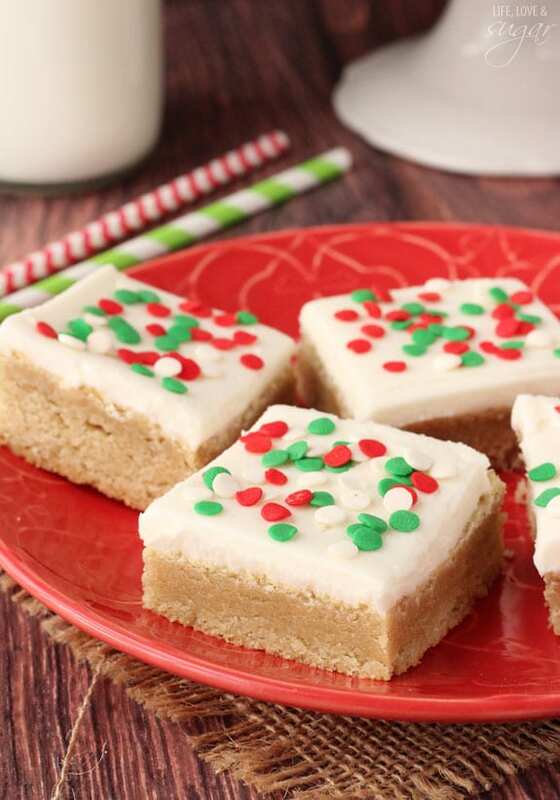 I made sure to use McCormick vanilla extract in these sugar cookie bars too. 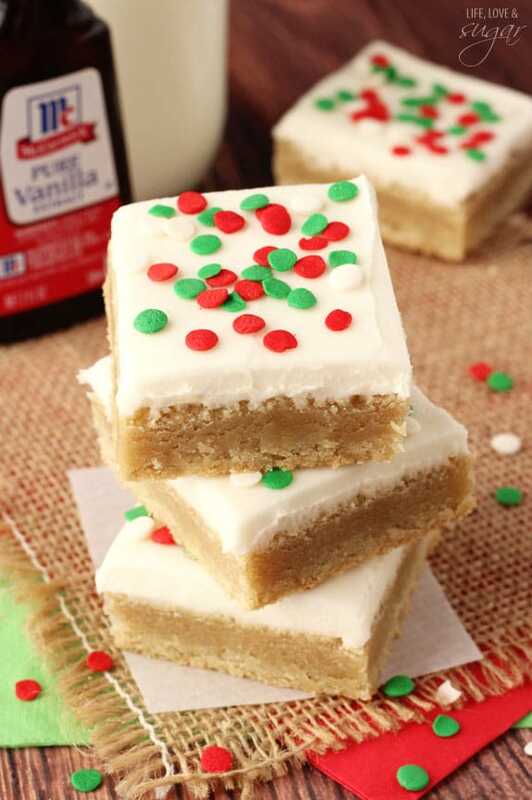 It’s a great all natural extract that gives these bars just the right vanilla flavor! And being that the vanilla is the star of these bars, you want that perfect sugary sweet vanilla flavor. 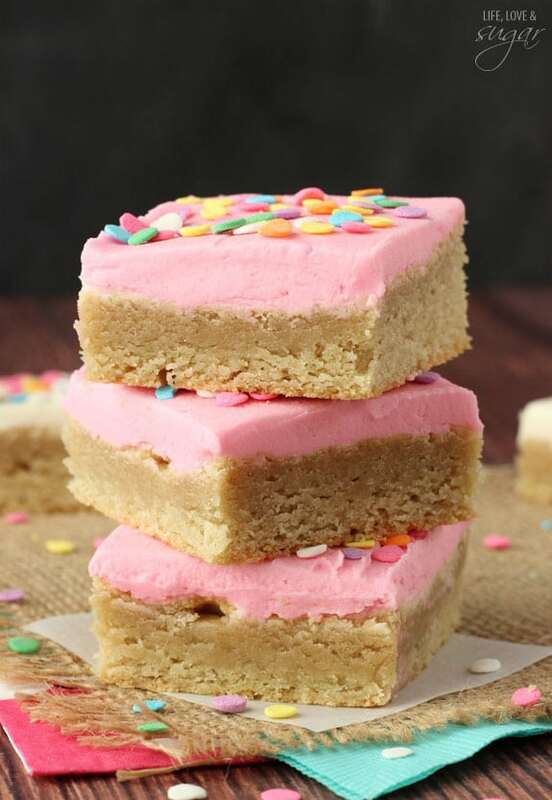 I topped my bars with a delicious vanilla buttercream. Again, the McCormick vanilla extract gives it the perfect flavor. Delish! You can easily color your icing and decorate them however you want. I’m a big fan of sprinkles. 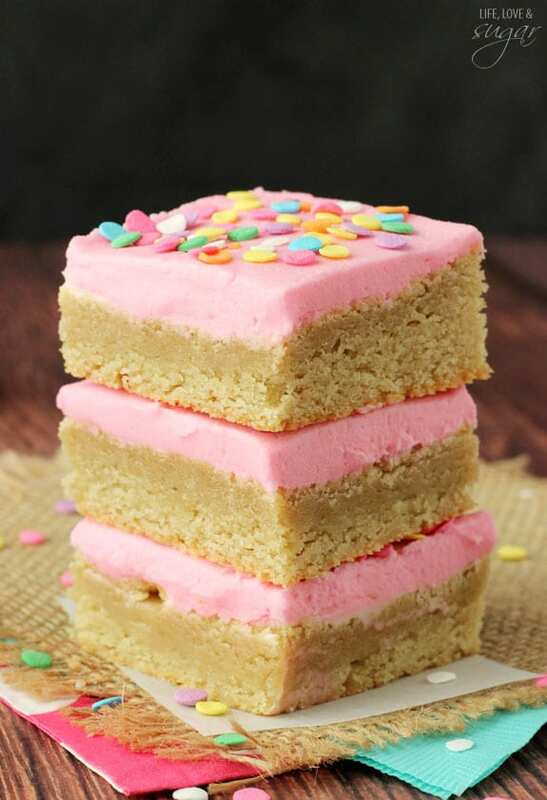 These bars are super moist and chewy. They almost melt right in your mouth. 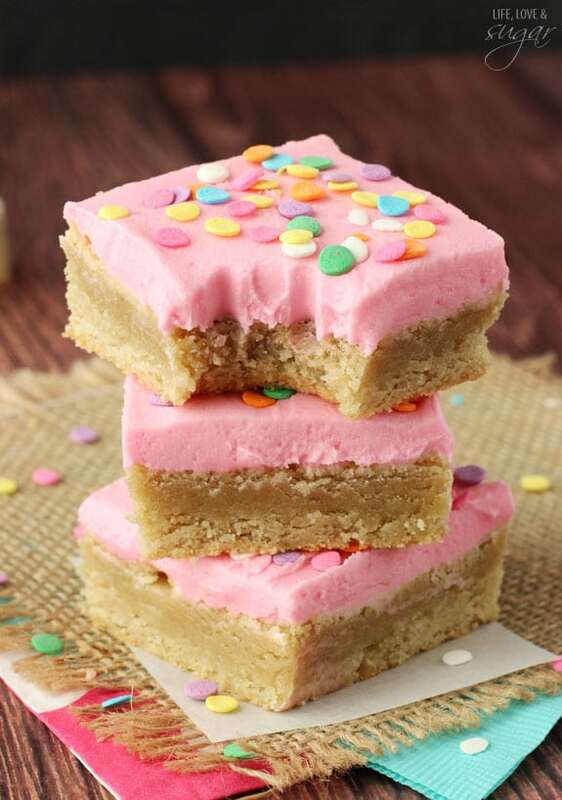 One of the things I love about a cookie bar is that when you get to those bars in the middle, there’s no edges and they are super soft all the way through. Bars are also nice and easy to make. No messing around with making balls of dough, which is great if you have a lot of cookies to make and hand out to people or take to a party. This is a sponsored conversation written by me on behalf of McCormick. The opinions and text are all mine. 1. Prepare a 9 inch square pan with parchment paper in the bottom and sides, sticking above the edges of the pan, and preheat oven to 350 degrees. 2. Cream butter and sugar together until light and fluffy, about 3-4 minutes. 3. Mix in eggs and McCormick vanilla extract. 4. With the mixer on low speed, add flour, cornstarch, baking soda and baking powder. 5. 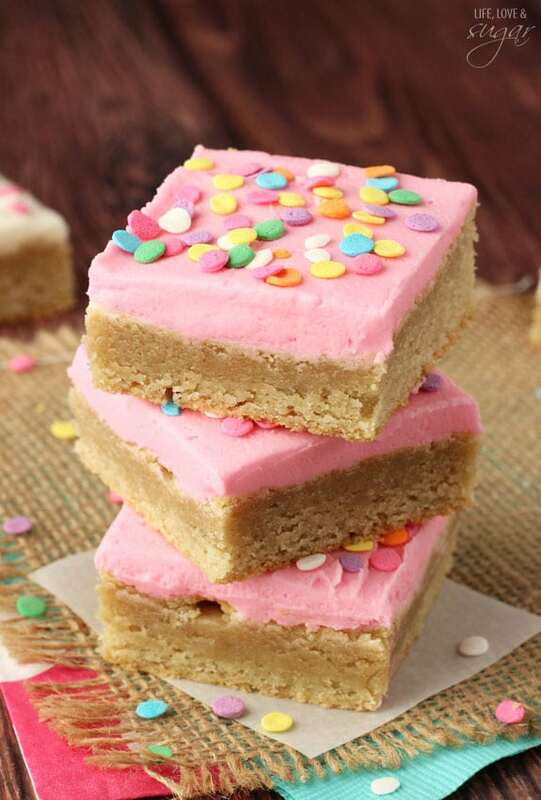 Press cookie dough into an even layer in the pan. 6. Bake for 19-21 minutes. The center of the cookie will still look a little undercooked, but that’s ok.
7. Remove from oven and allow to cool completely in pan. 8. Use parchment paper at edges of pan to lift bars out of pan. 9. To make the icing, beat the shortening and butter together until smooth. 8. Add the McCormick vanilla extract and mix until smooth. 10. Add water or milk as needed. 11. 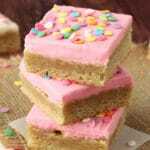 Spread icing onto bars and cut into squares.